Yikes! June is almost finished - just a few hours left! This is a quick post to prove that progress has been made! My June OMG (One Monthly Goal) was "to do some free motion quilting on my Neutral Lap Quilt - Take 5 Loves Coffee Milk", and I did! I sandwiched it on the weekend, did some stitching-in-the-ditch around each block and then decided on a few stencils to use. 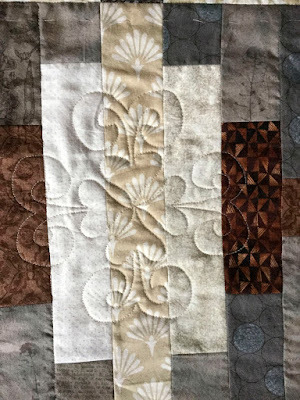 This quilted block is made from a large dahlia stencil but I'll be adding a little something later so that it fills out the edges of the whole inside block. 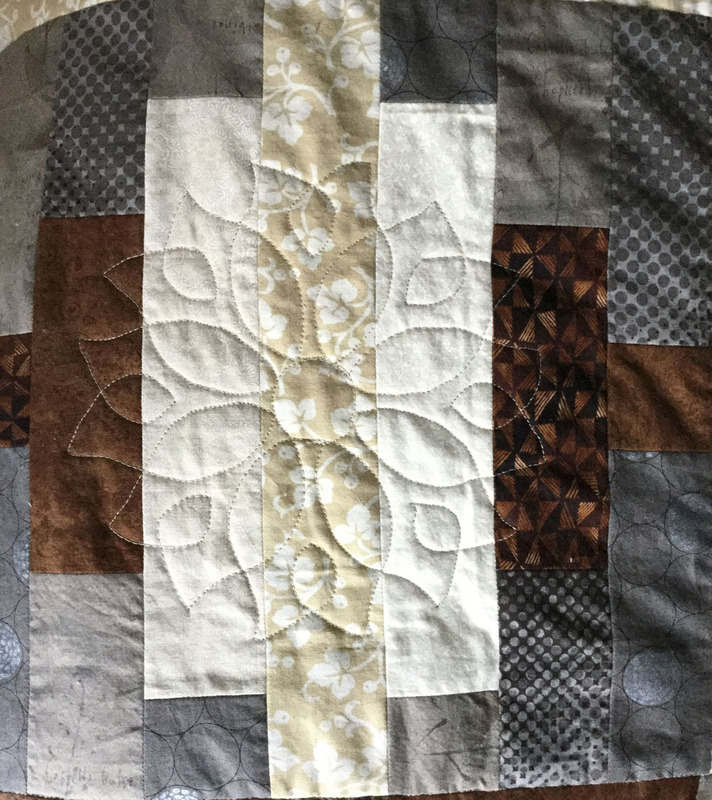 This quilted block is from a lotus flower stencil. This was great since it does take up most of the inside block. I just added a leaf on both sides of the middle strip to complete it. This third block has a fanciful heart motif. I'll be adding a little something extra so that it takes up the whole space of the inner block. 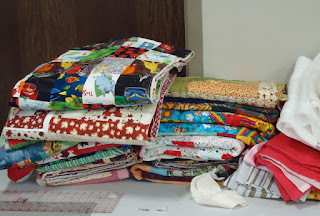 I now have 13 more blocks to quilt! I'll be using these stencil patterns again as well as one more that I haven't tried out yet. 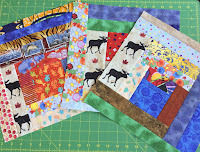 I also found a great series of Free Motion Quilting (FMQ) sample blocks at ipatchandquilt. 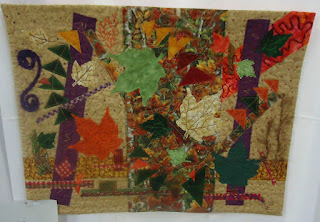 I have been practicing Esther's Fantasy block which is part of her FMQ samples - part 13 - orange peel variations. 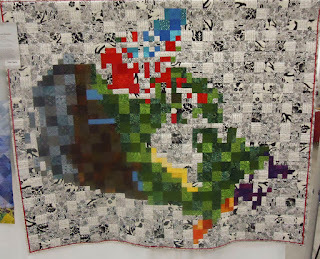 Have a look (see Related Links below) - she is doing some amazing quilting! I've been adding to the stem stitch sampler which I started on my trip to Quilt Canada last week. I'm calling it Étude in Stem Stitching. Étude in Stem Stitching - to date! I had a great time coming up with different FMQ designs to draw and then stem stitch. I did use a few detached chain and lazy daisy stitches. Isn't is amazing how a photo lets your really "see" your piece? 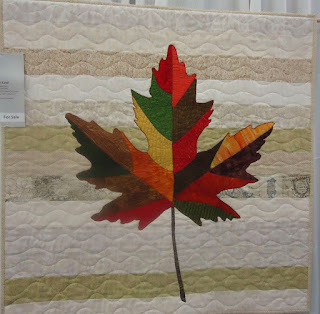 One of the National Juried Show winners at Quilt Canada said that she takes pictures at every step to review how her quilt is coming along. I really want to use this technique. I'm mentioning this because as I look at the flower here, I see that I should be adding a few more petals in the lower right side to even it out. Come back tomorrow for Canada Day - Celebrate - Fêtons 150! As I just mentioned, I want to take more photos of my pieces, especially those that I am designing, to get another perspective of the work. This is one lesson I really hope I will remember. Countdown to Canada - Fêtons 150! Countdown! In 9 days Canada will be 150! As you can imagine, there are many events already under way and many more planned. 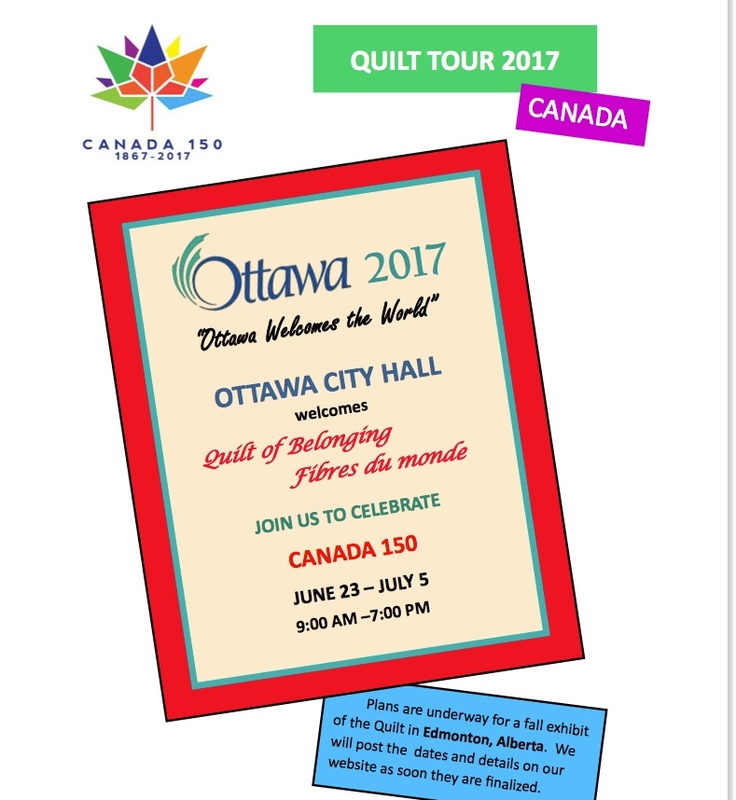 On June 23 the Quilt of Belonging will be displayed at the Ottawa City Hall until July 5. This should be on your list of things to see if you're in Ottawa during these dates. There are also visits planned to other Canadian cities, but if you can't make it, their website is well worth a look. See below in the Related Links. 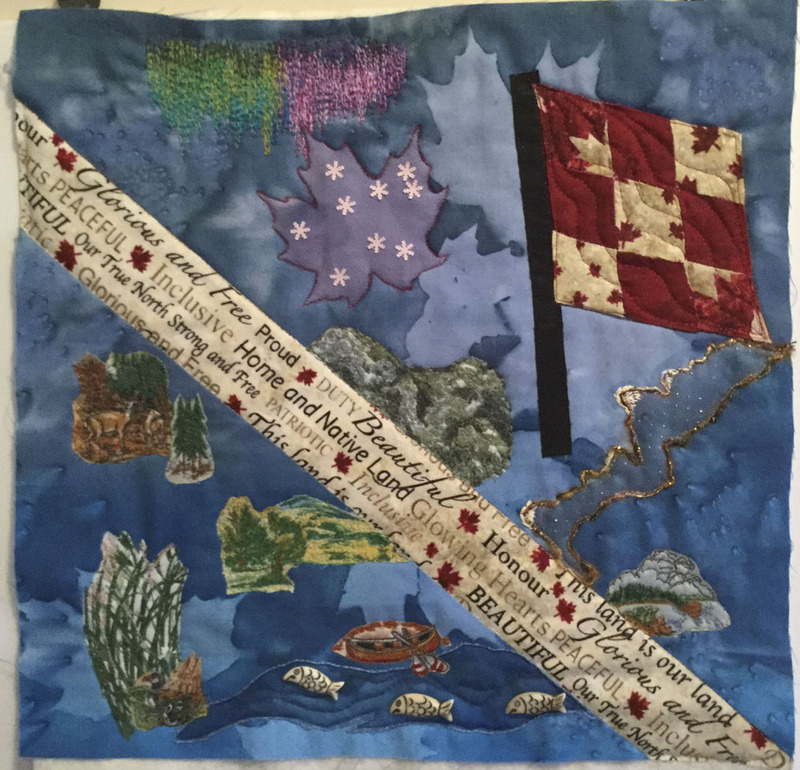 The quilt of Belonging is a collective work of art that was created to celebrate the diversity of Canada's people. Everyone that I know who has seen it was very impressed. I've made plans with a girlfriend to visit it on Monday. Yeah! 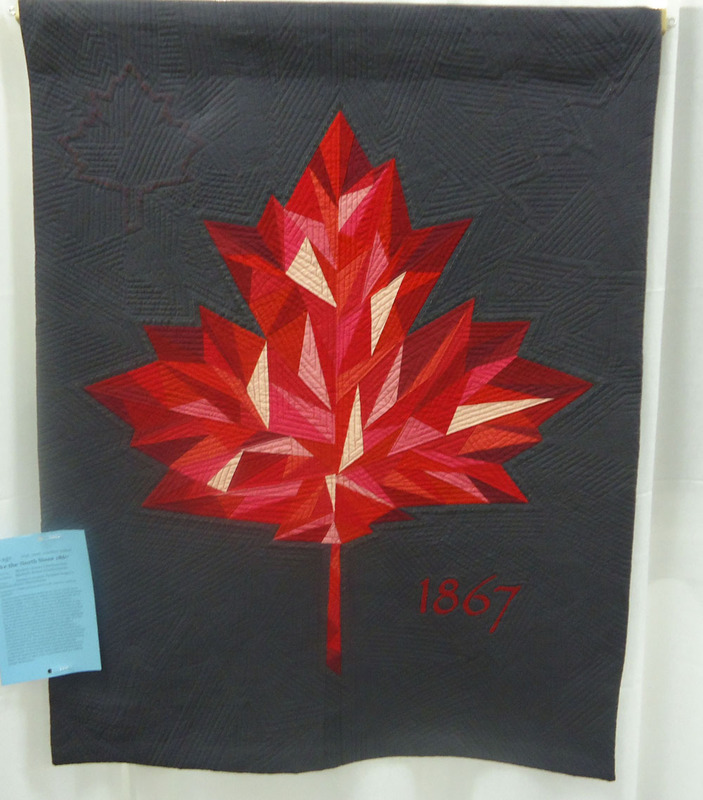 Last Friday I took the train to Toronto to attend Quilt Canada 2017. Wow! 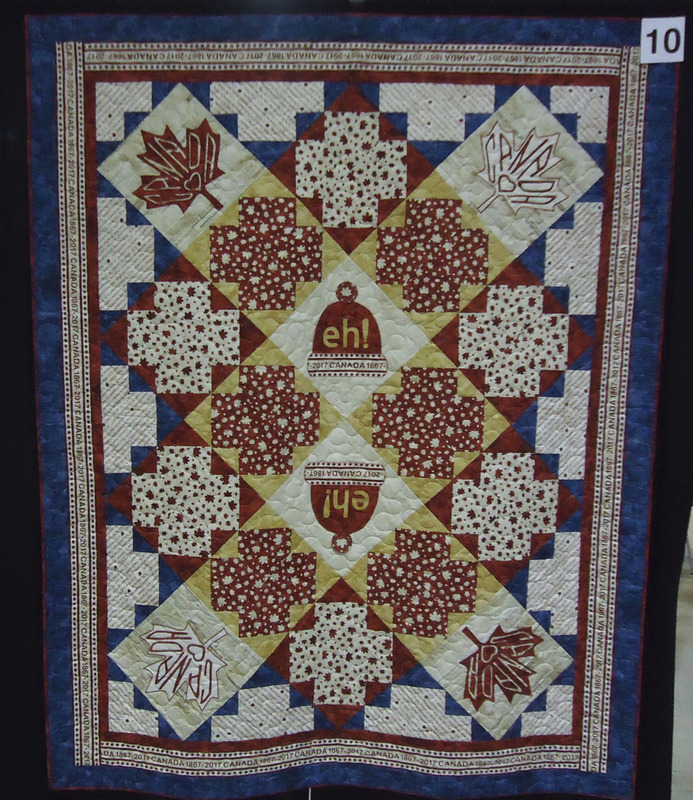 The quilts were incredible. It was so awesome to see these works of art. The highlight was the National Juried Show. This year they offered tours of the winning quilts. The tour I attended was lead by one of the judges of the show. What a great way to learn about the judging process and find out what they look for. I'm not posting any pictures of the National Juried Show because I didn't take any (I can't believe it either!) 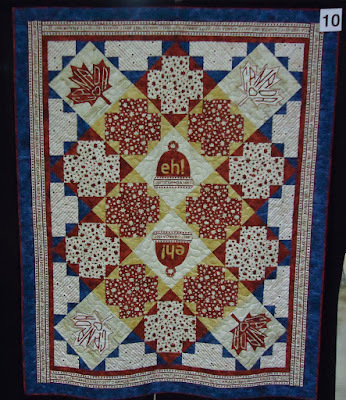 The organizers created a booklet of all of the quilts in the show and I bought two copies :-) I just found the link to the winners of the National Juried Show, so it's below in the Related Links. Another quilt exhibition at Quilt Canada 2017 was the Sesquicentennial Quilts of Valour Challenge. 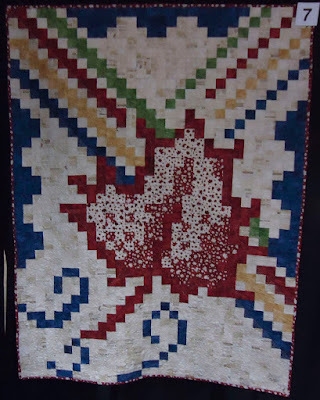 Quilts were created using Northcott’s Canadian Sesquicentennial collection and then donated to the Quilts of Valour. The top 15 quilts were exhibited and everyone attending the show was asked to vote on their favourite. I've been checking the Northcott website but haven't seen the results of the voting yet. I will add the link to Related Links as soon as I find it. 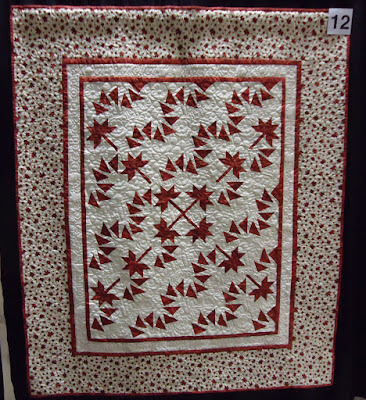 I heard many people talking about quilt number 15! 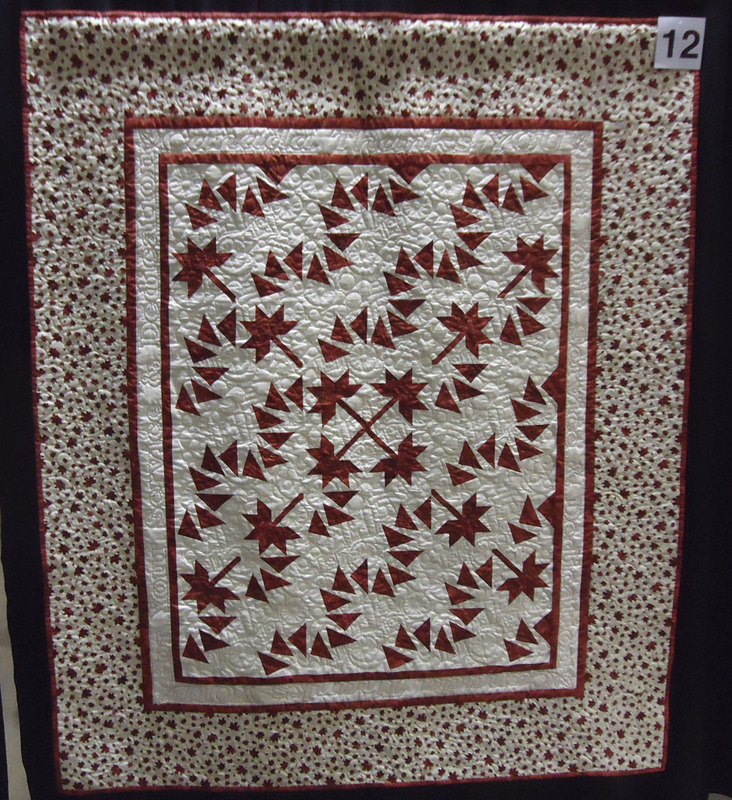 Check out the details of Quilt #12 below. 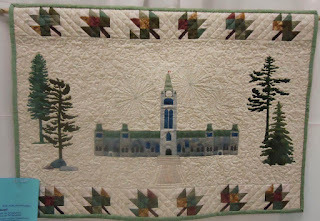 Quilt #12 details - "For your service & dedication"
Quilt #12 details - "Canada Thanks You"
Do you remember these? They were scrappy slab blocks made for quilts going to Ronald McDonald House. 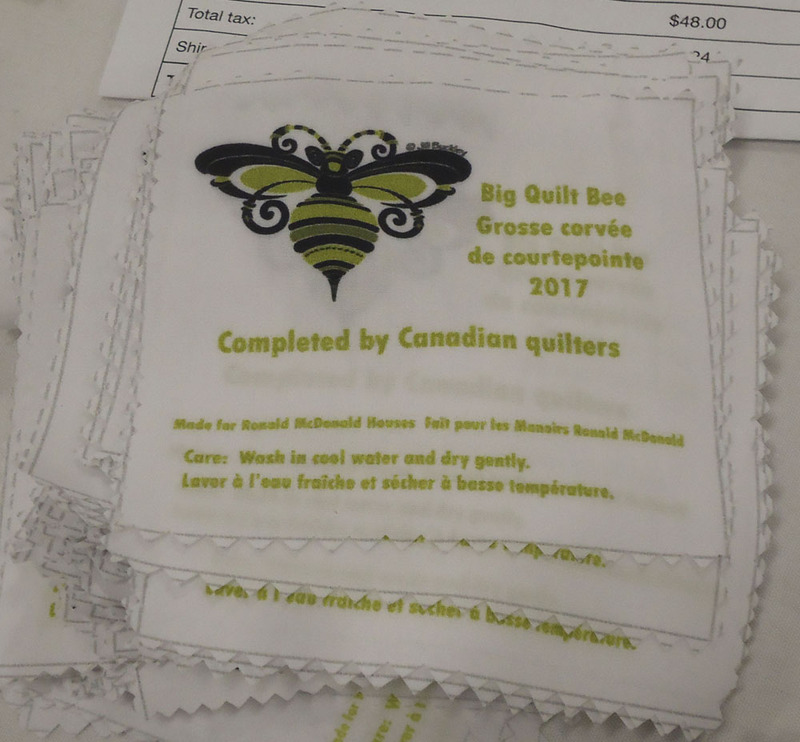 Many of the quilts were pieced and quilted by volunteers during Canada's Biggest Quilt Bee, held during Quilt Canada 2017. 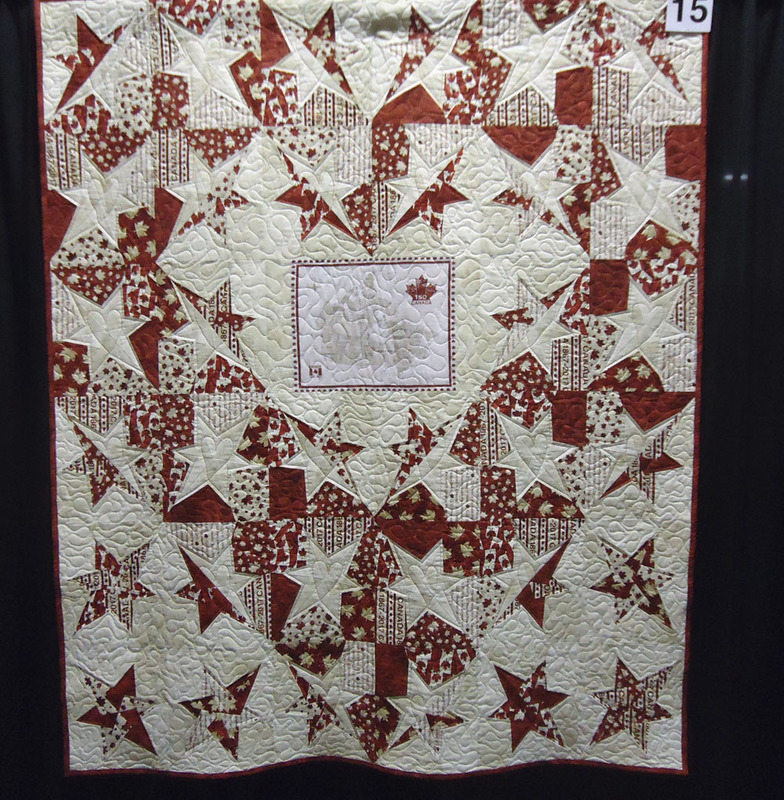 Here are some pictures of the different work stations at Canada's Biggest Quilt Bee. I got a lovely guided tour. It was near the end of the day, so it was rather quiet at the Quilt Bee. Volunteers had worked hard all day and were taking a well deserved break. I'm sure it started all up again the next day! There were stations spread out efficiently through out 3 rooms. 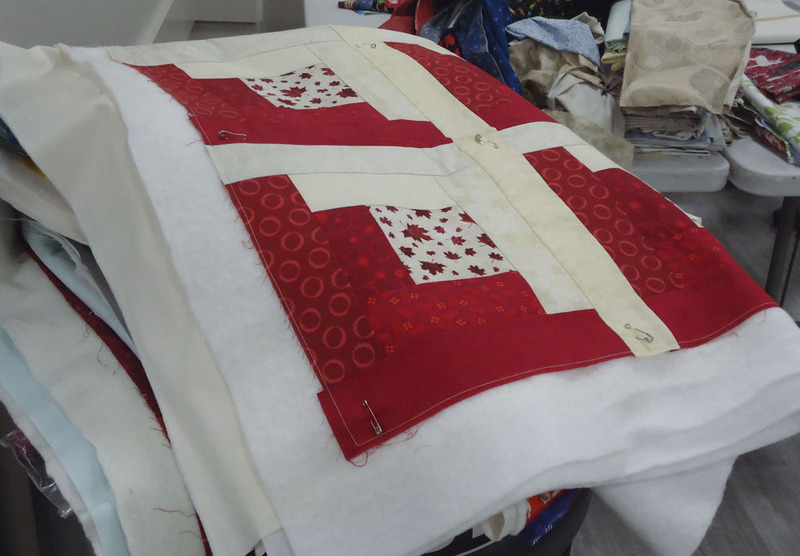 The blocks and quilt tops were received at one end and progressed through the many stages. 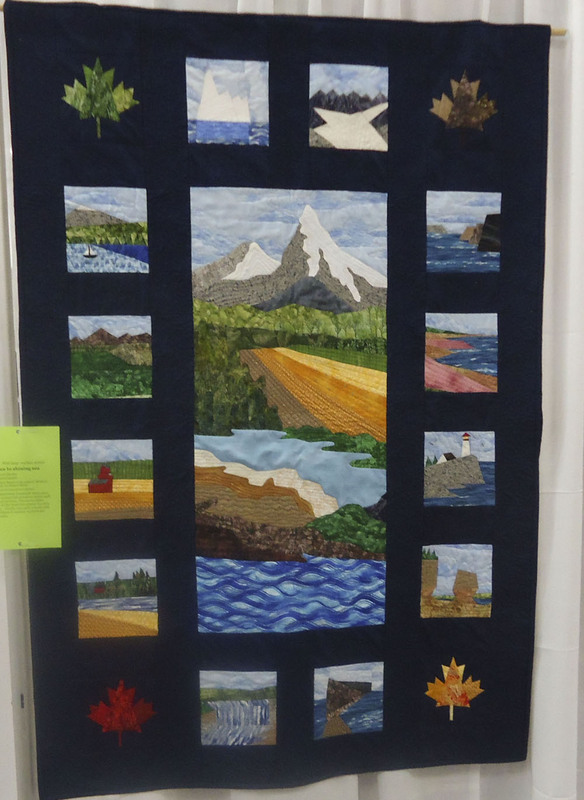 There were 6 or 8 people sewing slab blocks together to make quilt tops. The quilt tops were then pilled up to be sandwiched while the batting and backing were cut. 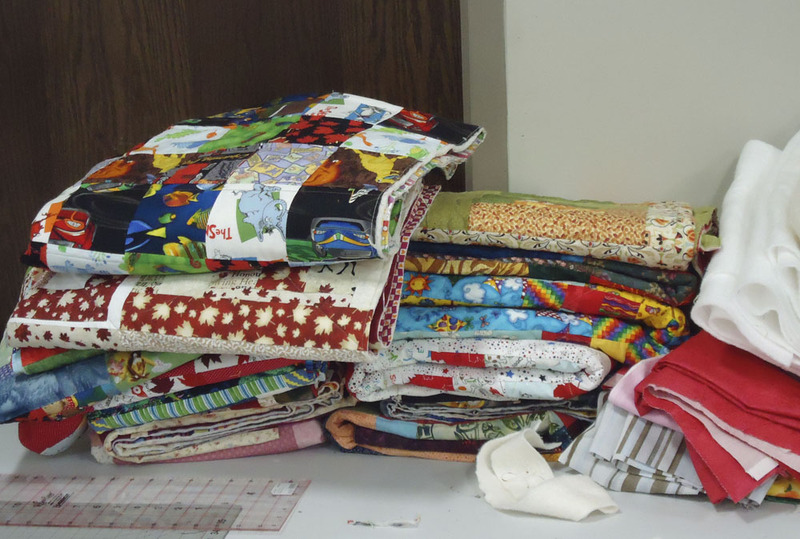 After being sandwiched, the quilts were piled, ready to be quilted in the other room. Volunteers at several long-arm and domestic machines free motion quilted them. 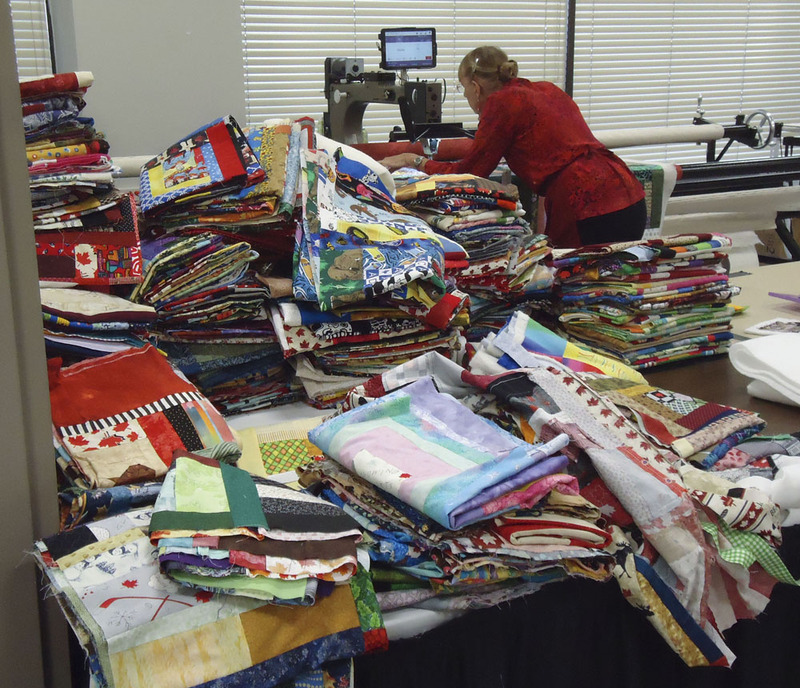 I spoke to one volunteer who was FMQ a quilt on a domestic machine that she had never used. It was a challenge! 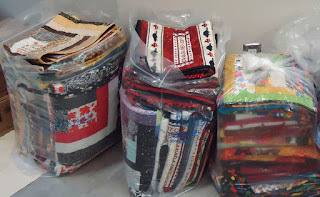 After being quilted, they were piled on another table for binding and the label. 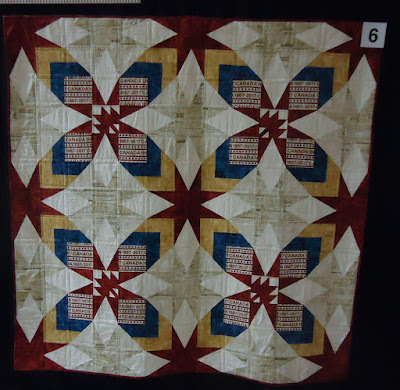 Once completed, the quilts were placed on another table for folding. 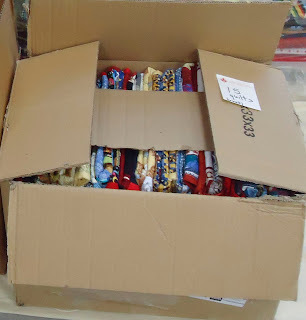 These were placed in bags or boxed for shipping. 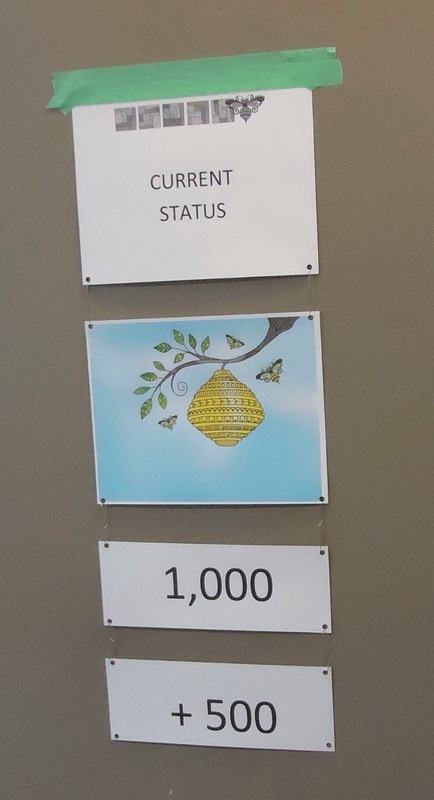 As I was leaving Canada's Biggest Quilt Bee, I noticed this on the door. The original goal was to donate 1,000 finished quilts to Ronald McDonald Houses across the country. 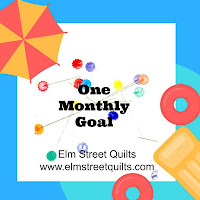 Based on how many quilts my own guild donated (Common Thread Quilt Guild sent over 100 blocks and 50 finished quilts), I'm not at all surprised that they exceeded their goal. 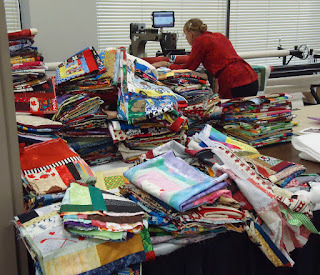 Quilters are incredibly generous people! 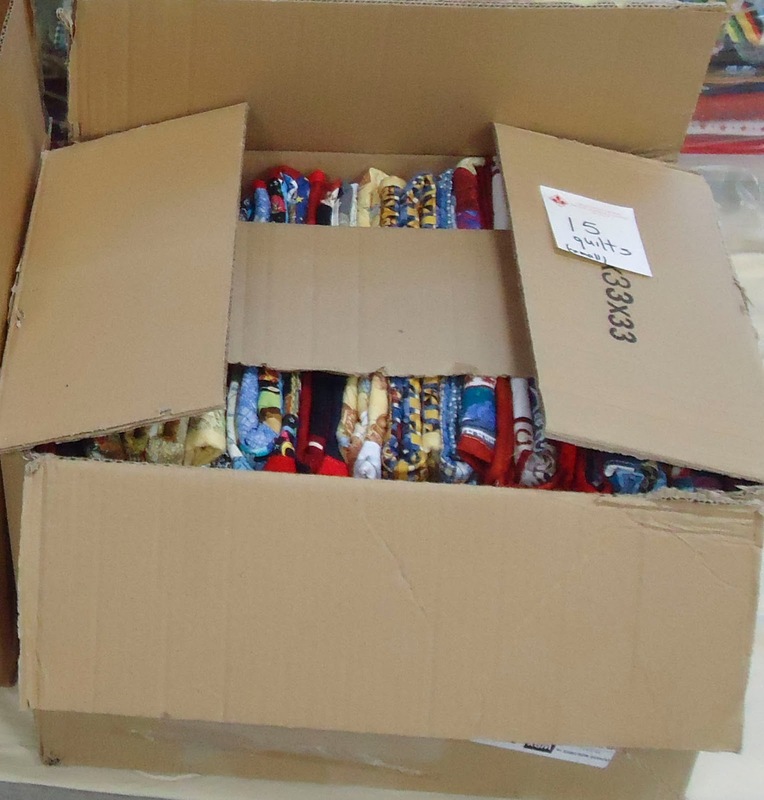 The final count was 2614 quilts! 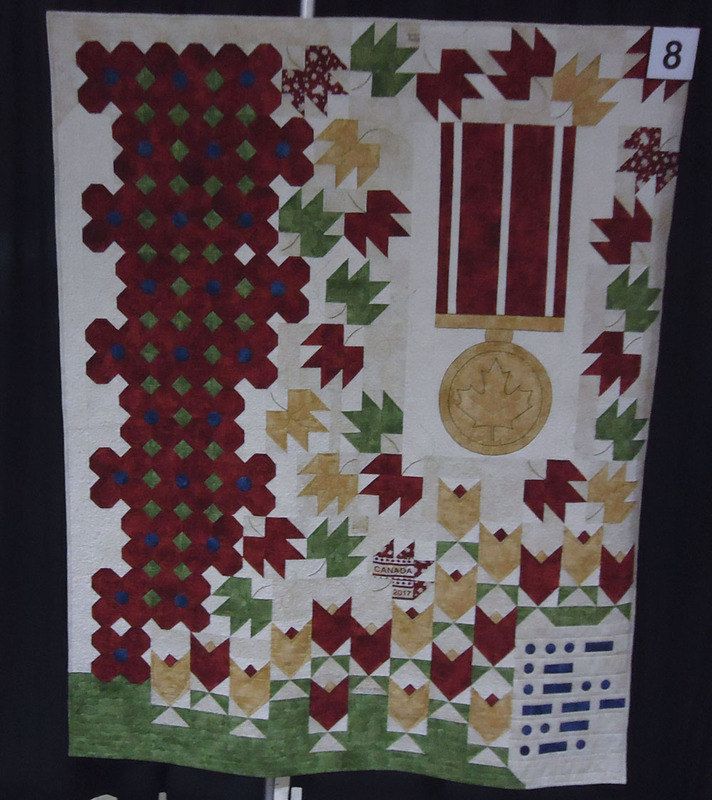 I also have a few images of the Youth Challenge, the Guild Rosette Invitational as well as quilts made for the Centennial in 1967. Come back on July 1st for these. While I was travelling on the train, I practiced my stem stitch. 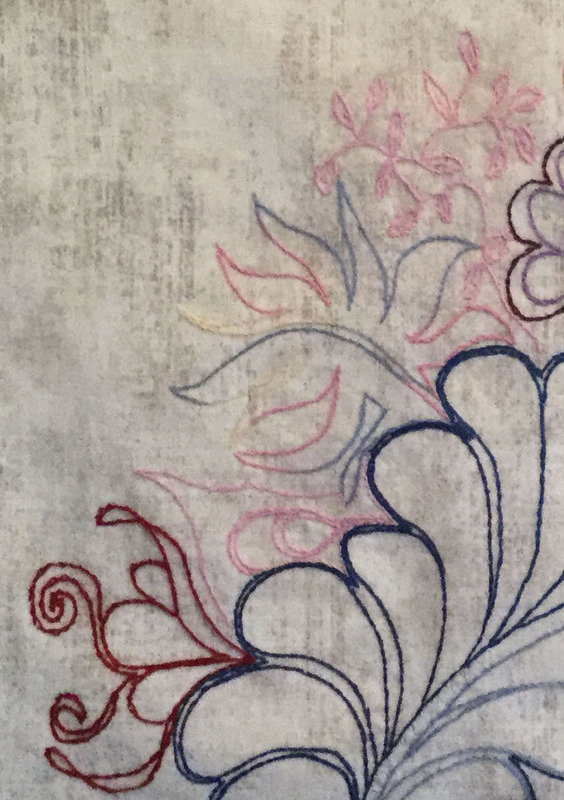 Before I left, on a fat quarter, I drew some free motion quilting designs that I typically use and proceeded to embroider them using a stem stitch. I practiced for about 6 hours during that trip and my stem stitch is getting better. 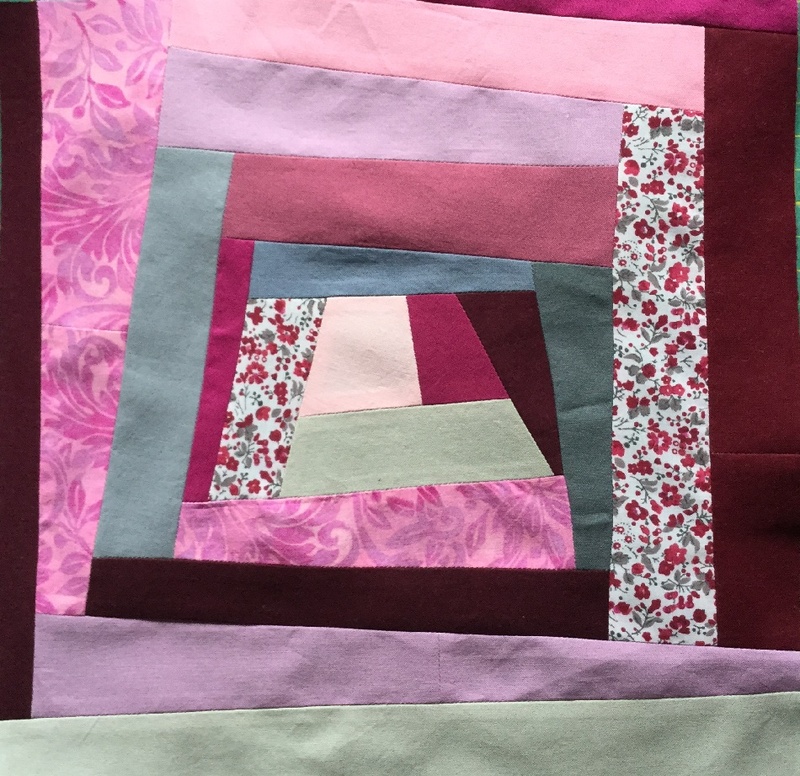 Finally, here is Block 6 of the Growing Up QAL. It's a "Famous Jane" style block. I had never seen this before. It was interesting and had a bit of the improv feel when adding the final 4 pieces. This was the first complete national juried show that I've attended. It really changed my perspective on juried shows. 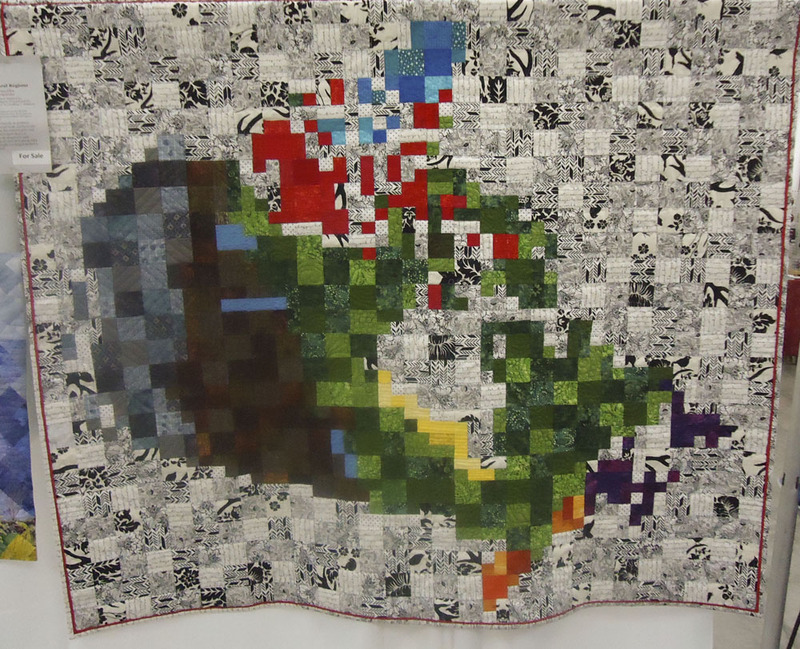 Because I had only seen pictures of the winning quilts, I didn't think that I could ever submit a quilt. However, at the show, there were many quilts in every category that were great, but much more achievable to make as a quilter or artist. 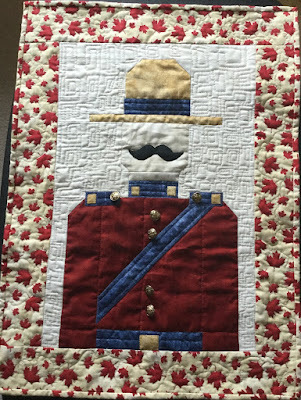 I've enjoyed making Canada 150 quilts, but following other people's patterns and doing traditional quilting for any length of time is difficult for me. I need time to create and play with fabrics without a pattern or clear idea of where I'm going. So I decided to create a Canada 150 art quilt with some of the techniques I learned during Hillary Rice's surface design workshop. 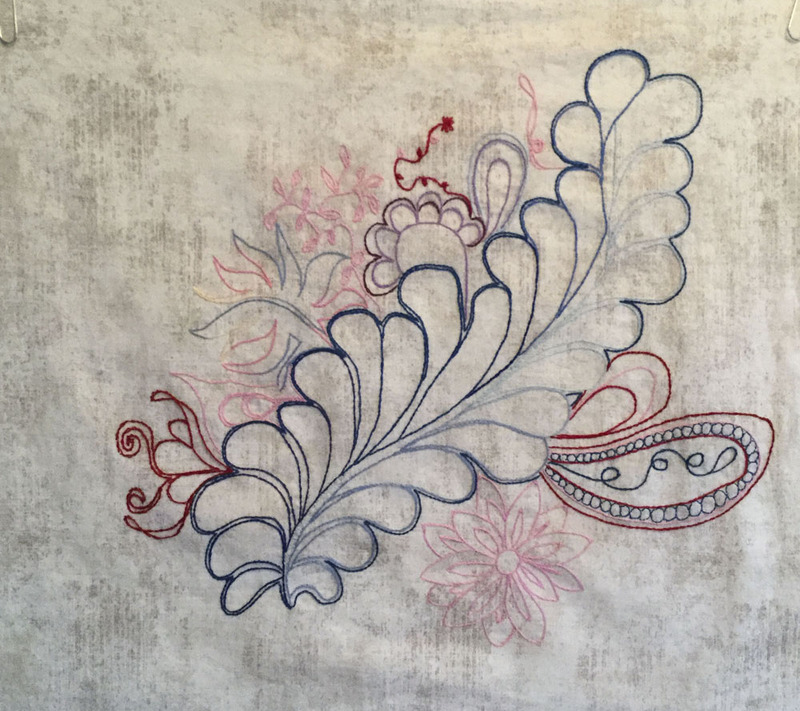 As you may have read in my post, several weeks ago I took a two-day surface design and embellishment course with Hillary Rice. It was great to learn new techniques from this wonderful lady, but I felt unsettled. We sampled many techniques and were supposed to create an art quilt using these, but even as I started two pieces I couldn't get into it. In retrospect, I think I needed a theme or a vision for the art quilts, especially abstract ones. This piece started with English Paper Piecing. 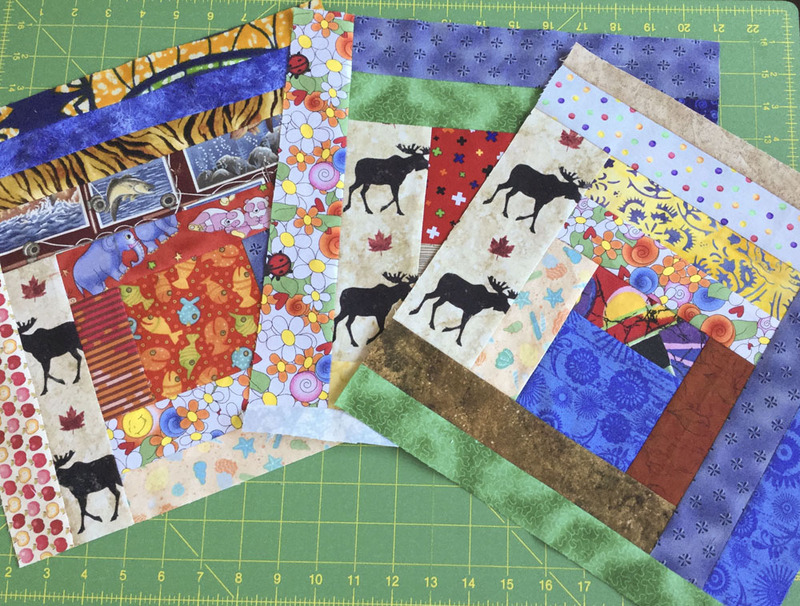 Using a diamond template that I bought at the Festival of Quilts show and freezer paper, I made some diamond pieces with Canada 150 fabric. Do you recall that I've said, many times, that I'm accuracy challenged? 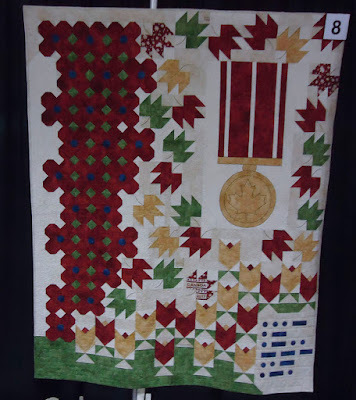 Well the diamonds were not accurate but I did manage to put these nine pieces together as a symbol of a Canadian flag. 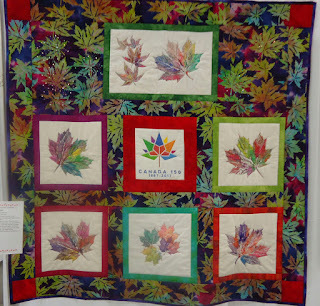 For the background, I used some beautiful blue eco-printed fabric with maple leaves that I bought at Fibre Fling 6. I added a strip of text fabric in the middle and then started playing. Here are the steps and the different techniques I used from the workshop. After appliquéing the English paper pieced flag, I used sheer overlay for the centre maple leaf. I placed the pink tulle over the leaf and free motion stitched around the leaf in a bright red Rainbows thread by Superior Threads. I left an opening because I was hoping to find something to place within it. This is called encasement - and I finally found a little cutting tool that made snow flakes - how perfect! At the top left, the fabric suggested Northern Lights. I used shiny Madeira Polyneon and Gütermann machine embroidery thread to do free motion embroidery. I really like the effect but as I look at the image here, I'm going to make the northern lights bigger. Under the flag, you can see the couching of knobby gold yarn. I followed the design on the fabric to outline some mountains. I attached the couching by hand and then, between the two couched lines I added some sparking sheer overlay. To give the impression of snow, I embroidered three of the mountain peeks. At the bottom centre, again following the outline of the fabric, I added several layers of organza and embroidered around them. I know that I should have waited to add the fish, but I was too impatient. Besides, I just free motion quilted around them! Once this was completed, I had no idea how to add elements that would suggest various parts of Canada. I went into my landscaping stash and found some fabrics that I thought might work. I used the crafted appliqué method and ironed the fabric onto the background. I then free motioned appliquéd the fabric and added thread painting. I don't think that there's much left to finish this piece. I need to work on the northern lights and then probably free motion quilt designs in the background that will bring all of the appliquéd pieces together. I'm not sure if I'll be able to add more techniques I learned to this piece. There are still 11 techniques to go! Maybe this will encourage me to keep working on my class pieces! I didn't realise how many techniques we had covered until I started going over my notes and looking at my samples. Although I knew some of the techniques, there were many that I've wanted to try out but didn't really have the courage to do so by myself. 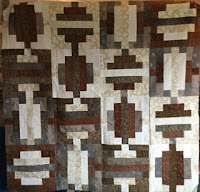 The Sergeant Sesquicentennial block from Quilting Pleasures is done! No offence, but I hope I never have to write those two words again! I keep spelling the first word wrong and I don't even want to pronounce the second - thank goodness for copy and paste. Canada's 150 will have to do! 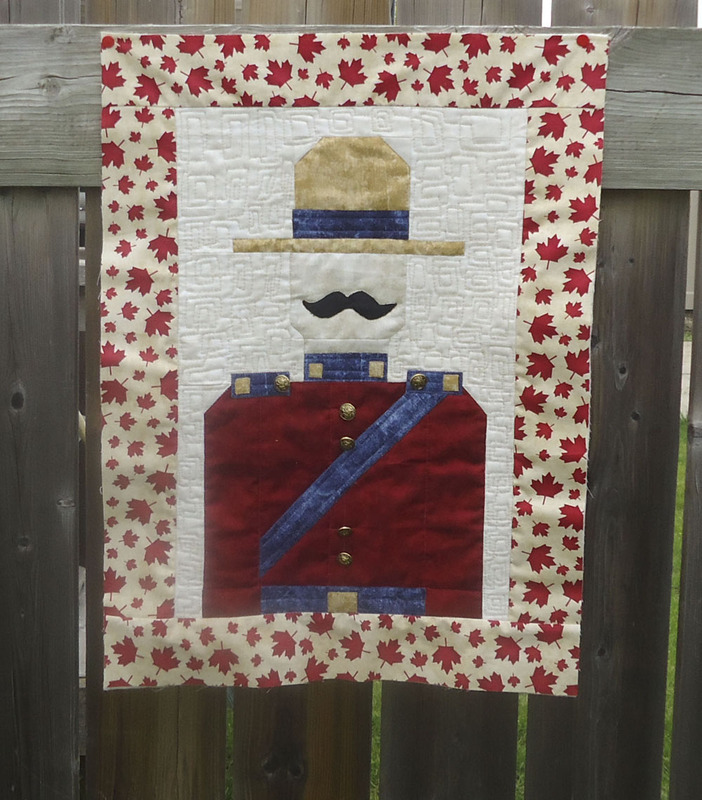 This gentleman is part of the Northcott's Trans-Canada Block Party and is sold exclusively at Quilty Pleasures in Orleans. 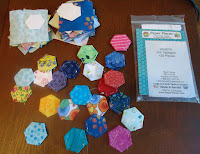 I picked up the kit for the block and fabric for the border and binding last month. The piecing went fairly well, except when I reversed his torso and gave him huge shoulders and a tiny waist! After fixing that, it was all good. I really wasn't sure how to quilt it. In-the-ditch around the guy was easy but what next? I wanted a background that might look like wallpaper behind a portrait. 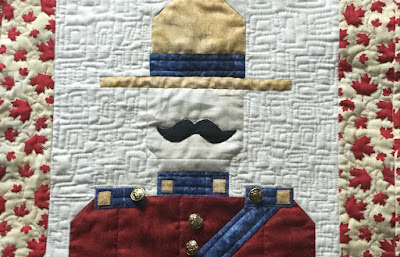 With all the straight lines in the pattern, except for the mustache, I thought that something linear would be appropriate. 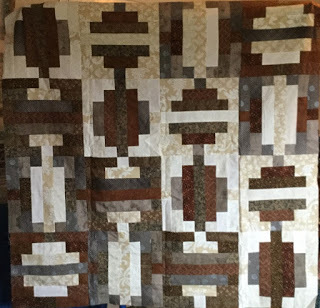 I chose to FMQ blocks since vertical lines would have accentuated my accuracy-challenges. In my last post, I hadn't quite completed the quilt. I still needed to bind it and then finish quilting the borders. If my order of doing this sounds like a mistake - it isn't. 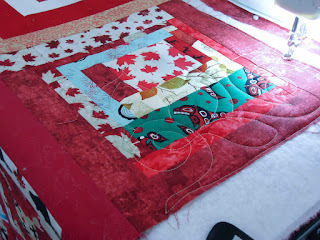 When borders are not very large, I will often FMQ the body of the quilt, square it off, bind it and then quilt the border. So far I haven't found any reason for not doing it this way. I had such a good time making this block! I went through my scraps of pink fabrics and found two great pieces to add to the pink and grey solids of my other blocks. The grey and maroon flower fabric is a scrap from a quilt my mother made a very long time ago. Improvisational blocks are some of my favourites - few rules and lots of potential! 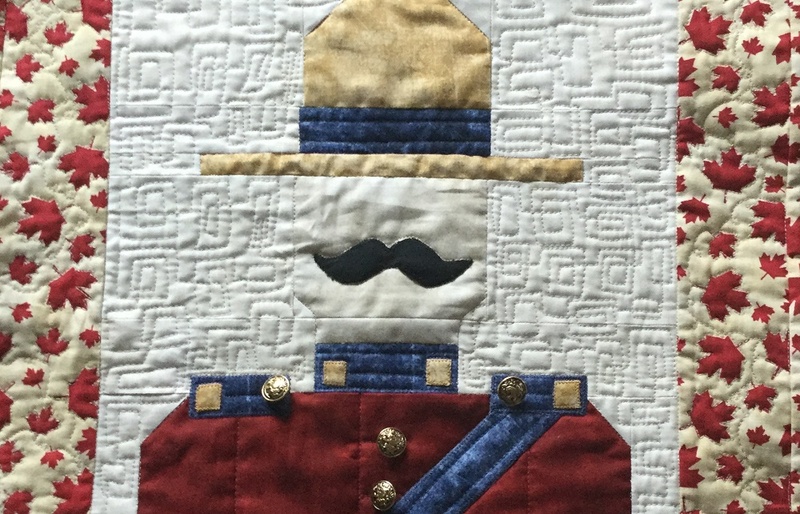 I need to try different techniques if I want to keep making Canada 150 quilts. I get very easily tired of making conventional quilts and blocks. 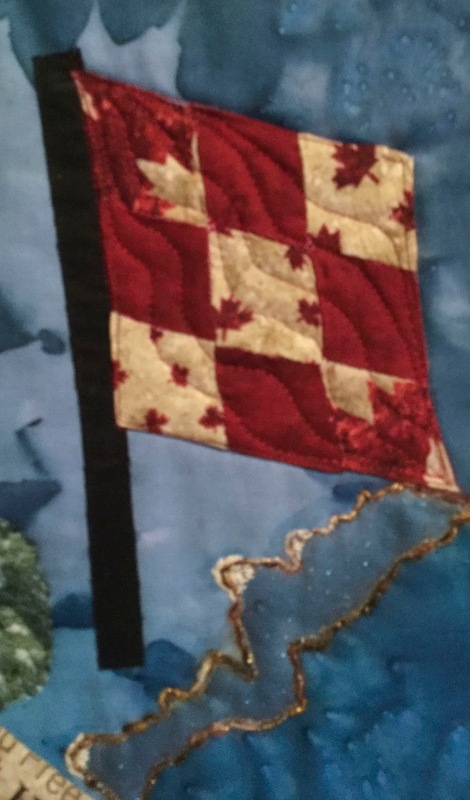 I've started on a couple of Canada 150 art quilts - using some of the techniques I learned from Hillary Rice's workshop. Hopefully I will have something to show you soon. I've been using a bit of Best Press to starch my daughter's appliqué. I used it on the block today - it makes it look great for photographing. I've heard of people starching fabric when piecing them. I may give that a try. 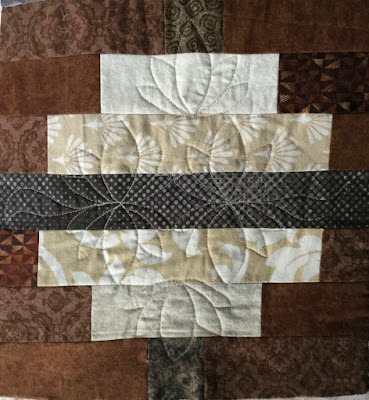 Pattern: Sergeant Sesquicentennial block from Quilting Pleasures. June is here and it's only a little over a month to Canada Day, our 150th birthday! The Celebrate - Fêtons 150 had a good month although the numbers are down for the link-ups. 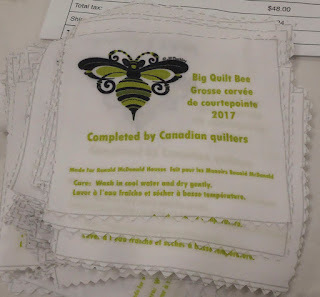 That's probably because everyone's slab blocks have been sent to Toronto in preparation for Canada's Biggest Quilt Bee. 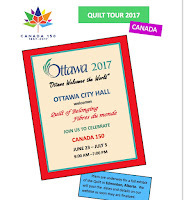 I don't think that I will be participating, but I hope to visit and take pictures while I'm at Quilt Canada 2017. Your intrepid reporter will bring back photos of all that's happening on the Celebrate - Fêtons 150 front! 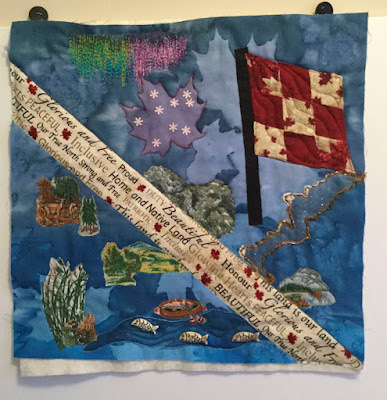 May's winner of the Sergeant Sesquicentennial kit from Quilty Pleasures in Orleans is Terry Aske of Terry Aske Art Quilt Studio. Congratulations! As you may be able to tell, I finished all of the free motion quilting (FMQ) except the borders. 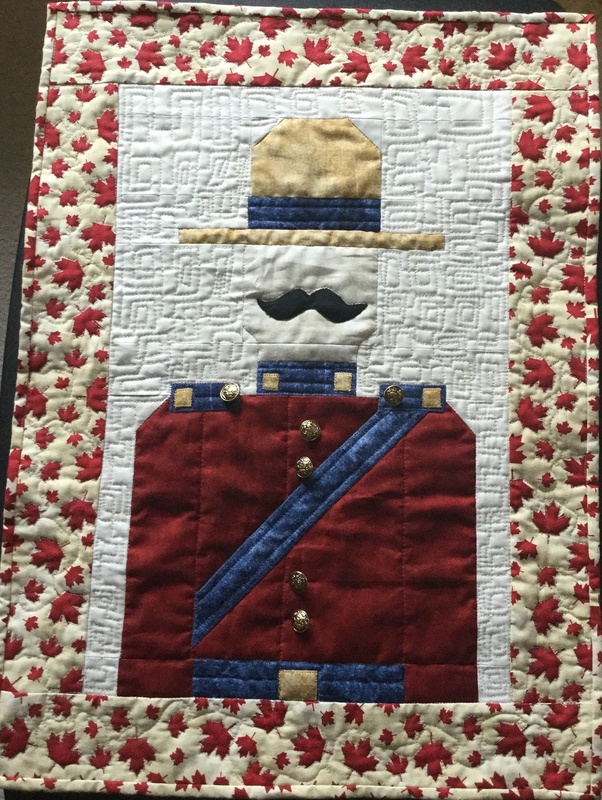 I did sew on the brass buttons once the quilting of the Sergeant was completed. 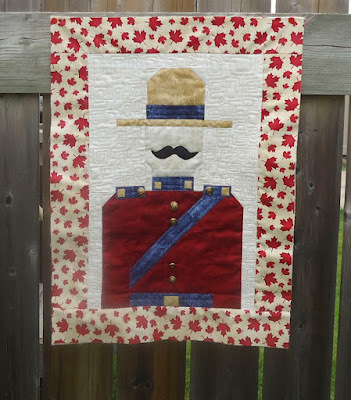 When I finish binding and quilting the borders, I'll write a post on this celebratory guy! In my last Celebrating 150 post of two weeks ago, I posted pictures of the Canada 150 Interguild Exhibit that was shown as part of the Ottawa Valley Quilter's Guild Show - Festival of Quilts 2017. Now I have another treat - a selection of the quilts made by members of the Ottawa Valley Quilter's Guild. 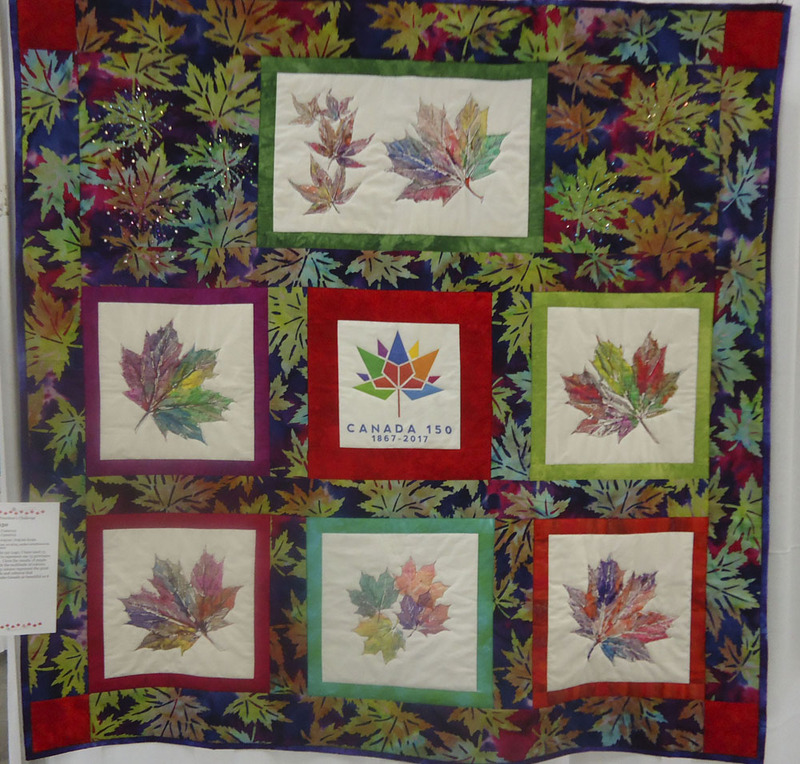 Some of the quilts were made as part of the President's Challenge - to create quilts representing the diversity of Canada. 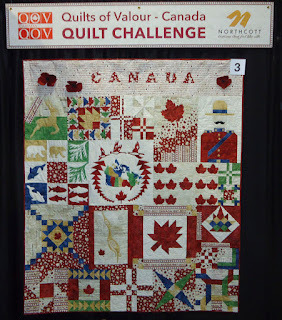 Other quilts below are not from the challenge but represent Canada beautifully (in my opinion). 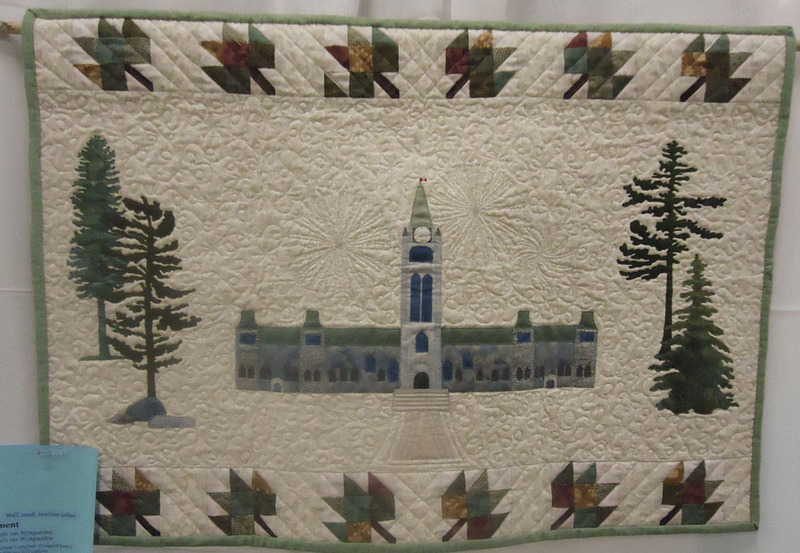 This quilt is of the Centre Block of the Parliament Buildings. 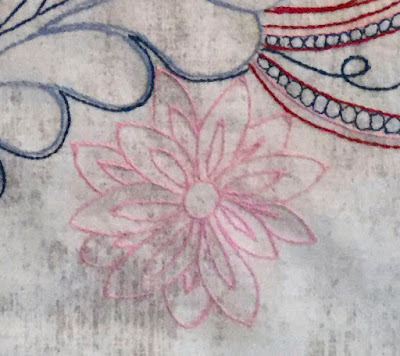 It has some lovely, subtle fireworks in the FMQ. In Canada, it's difficult to celebrate our country without the maple leaf. This first quilt has 13 leaves to represent the provinces, territories and the diverse people of Canada. 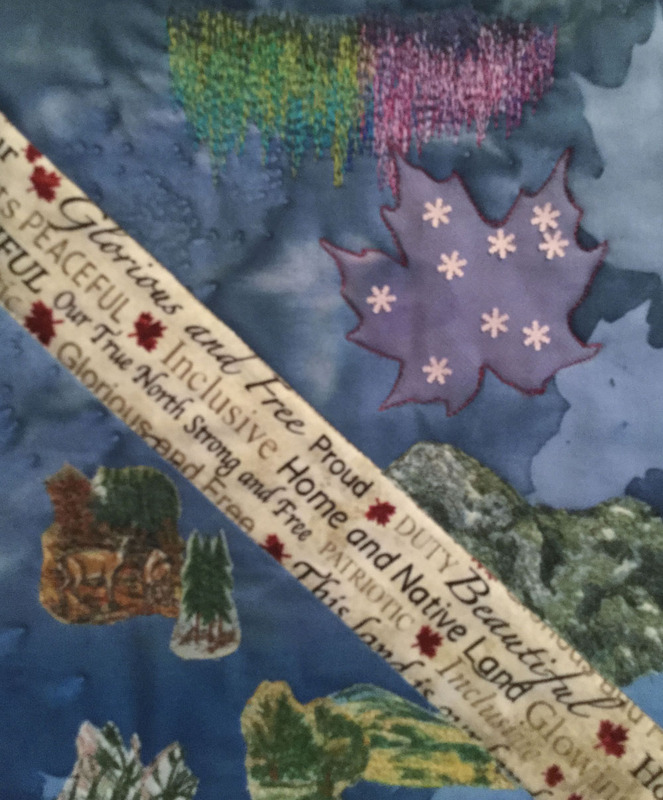 These next quilts celebrate the diversity of the geography of Canada. 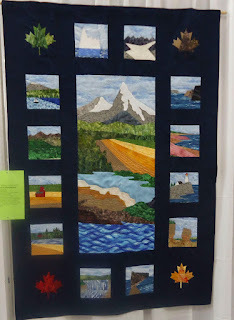 based on the pattern "Windows Across Canada"
I hope that you've enjoyed this Celebrate - Fêtons 150 themed visit of the Ottawa Valley Quilter's Guild Show - Festival of Quilts 2017. 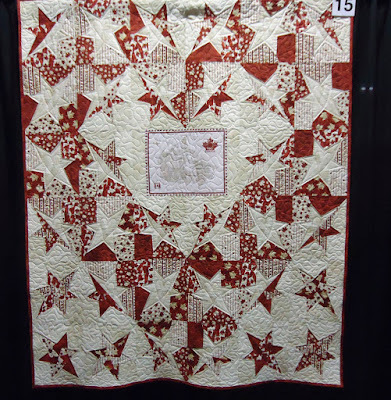 Later this month I will feature Celebrate - Fêtons 150 quilts from Quilt Canada. For my One Monthly Goal (OMG) for June I want to do some free motion quilting on my Neutral Lap Quilt - Take 5 Loves Coffee Milk. It would be nice to finish it, but if I can at least sandwich it and start quilting, I'll be very happy! Sergeant Sesquicentennial of Quilty Pleasures in Orleans Ontario. 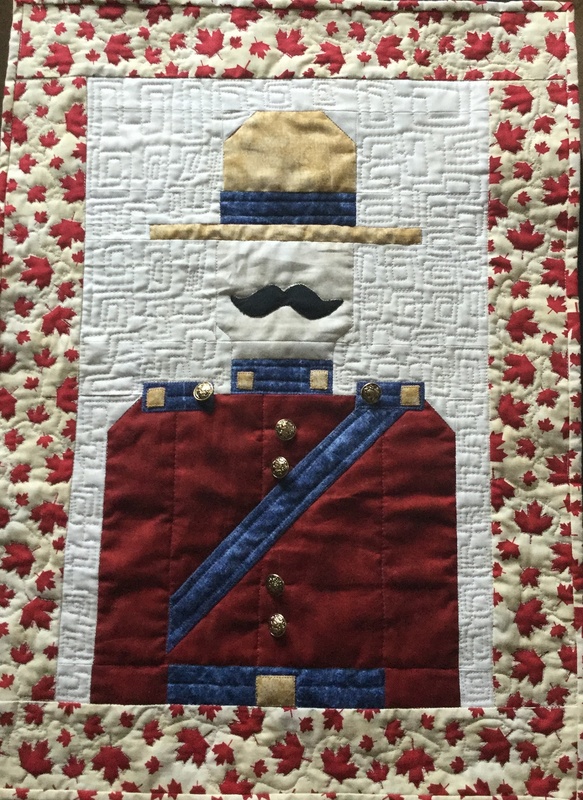 For the link-up and comments prize this month, I will be picking something up at Quilt Canada 2017 - it's a surprise! To download the button, click here.